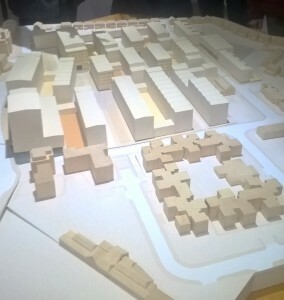 Harrow Council has unveiled plans for a major housing development on the Civic Centre site in Station Road. The authority plans to retain ownership of the site and oversee the creation of about 850 homes, new shops and school with the civic centre set to move to a new home in Wealdstone. Key concerns include the size and scale of the buildings, parking, green space and waste disposal. The development – named “Poets Corner” after the housing estate that was demolished to make way for the Civic Centre in the 1970s – will include around 400 parking spaces, 100 of which will be pay and display. It will also feature a new one-way service road, pedestrian route to Harrow and Wealdstone station and a “civic space” opposite Harrow Central Mosque, incorporating the war memorial. A formal planning application is expected to be submitted in late Spring next year. The development will be done in two main phases with work on the first phase starting by the end of 2017 if plans are approved. The rest of the scheme is scheduled for completion by early 2021.